Section 20 of the Real Estate (Regulation and Development) “Act, 2016 (hereinafter referred to as “RERA“) mandates all the States and Union Territory to establish a Real Estate Authority within one year from date of the commencement of the Act. 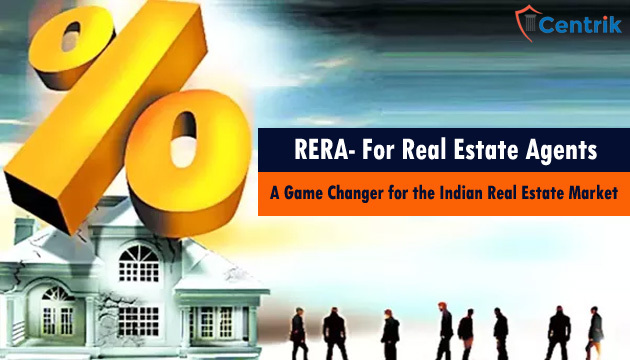 Before the RERA, Real Estate Agents were not required to get their business registered and thus resulted into many manipulation and fraudulent activities. RERA has streamlined most of the procedural steps, registration mandate, compliance to be followed, penal provision in case of the non-compliance of the Acts and Rules, etc. Pursuant to Section 9(2) of RERA and other corresponding rules Real Estate agents are required to make an application for registering their business. 1. Real Estate “agents should apply for the registration of their business. 2. Registration application should be made prior to the involvement in the activities relating to marketing, advertising or sale or purchase of any kind. 3. Details like name, registered address of the place of business, type of business, registration number, PAN, Aadhar Card No. 4. Particulars of the registration obtained to undergo other business, along with the articles and memorandum of the company (in case if the real estate agent is a company). Returns of income tax for last three preceding financial years. 5. Returns of income tax for last three preceding financial In case if the entrepreneur was exempted from filing of annual returns, then declaration for such effects. 6. Proof of address of the principal place of business, along with number of branch office, contact details, FAX no., email address of the company. 7. Detail information of all real estate projects and the promoters with whom Agent had carried out its business in last five years. 8. In case if the applicant is individual, then he has to pay the fees of Rs. 10,000 and Rs. 1 lakh for the applicant other than an individual. 9. Within 30 days from the application made, if satisfied by all the documents, Authority to grant the registration certificate. Brief details of the enterprise, which includes its name, registered address of the place of business. Copy of PAN and Aadhar of the agents. Photographs of the agent, and of all the concerned person in service for the respective project. Copies of letterhead, rubber stamp images. Copy of Board resolution or authority letter, in case if other person is authorities by the Agent to make the application on its behalf. Real Estate Agents to display the number of his registration at the principal place of the business and at its branch office. In case of the midsize and large number of Agents, where the business of the firm is functioned from more than one place, becomes mandatory for the Agents to mentioned the address of the Registered office and that of the principal place of the business. Further, it is required for the real estate agents to mention the registration number on the letterheads, communication letters, bills, invoice and any other related documents. Real Estate Agents are required to maintain the books of accounts, records and documents as per the applicable laws. Different laws and regulations has its own requirement to fulfill the compliance pertaining to the maintenance of the books of accounts and to get the books of accounts audited. Buyer of the property entrust their responsibilities in Real Estate Agents to assist them in purchasing the best property. Real Estate Agents are vested with lot of responsibilities to assist buyer and to exercise their roles and responsibilities and fulfill their obligations towards the buyer and promoters too. There is various benchmark based on which authority can consider your application as deemed fit to accept the registration. Agents are required to submit the details of their business along with the details of the business carried out with promoters in past five years, this will help the authorities to identify the strength of the business and to ask for any additional requirement. Interest of the buyers are expected to be safeguard to the great extent after the enactment of RERA act. Lot of procedural steps for the registration and the ongoing compliance of promoters and real estate agents will be transparent with the buyer as these details will be made available on the website. This is the new beginning, many of the financial sectors are expected to invest in real estate business as most of the business will be carried out with more transparency and with the knowledge of the buyer.